Valley City (INFORUM) — Prosecutors are accusing a Valley City man of trying to sexually assault two women that he allegedly held at gunpoint Thursday, April 4. 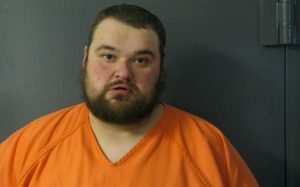 27 year old Zachary David Kline, is charged with two felony counts of attempted gross sexual imposition, two felony counts of reckless endangerment, two felony counts of felonious restraint and one misdemeanor count of possession of a firearm in a liquor establishment, according to documents filed Friday, April 5, in Barnes County District Court. The victims told police that Kline came into the bar around closing time and ordered drinks, and then left for a few minutes. He came back inside, pointed a gun at them and told them to go into a back room and take off their clothes, according to court records. Kline told authorities he started drinking around 6 p.m. and remembers coming to the bar and ordering two shots, but had no memory of the incident, according to court records. Kline told police he doesn’t carry a gun when he is drinking. Kline’s bail is set at $25,000 cash-only or $250,000 bond. He is being held at Barnes County Jail as of Friday afternoon, April 5.